ProCad Designs focuses on quality, relationships, and excellence. This means your amazing new home will maximize both the potential of your property and your budget. We focus on maintaining our core values, building relationships, and ensuring we always produce the highest quality of work. This focus allows us to design amazing homes that fit our clients’ lifestyles while both maximizing the potential of their properties and making the most efficient use of their budgets. We make people think differently about the way houses are built. We give houses a personal touch while keeping housing costs and better use of building materials in mind. We help people design their dream homes, making a difference in people’s lives and the community a better place. Respect: We ensure everyone feels respected, appreciated, and valued. Integrity: We operate in honesty and trustworthiness. Excellence: We do everything over and above expectations. Diligence: We find efficiencies and pay attention to the small details. Meaningful Relationships: We care about our clients and employees, and enjoy working with great people. 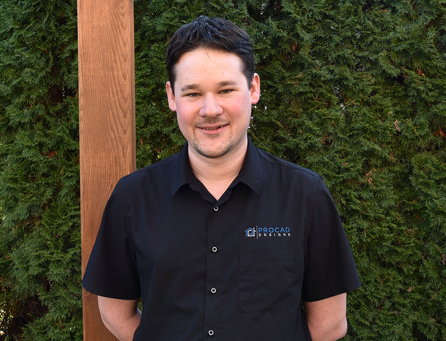 Ivory Winston has been with ProCad Designs Ltd since 2012 after graduating from the Thompson Rivers University Architectural Program in 2010. He came to the program after working both as a concrete finisher and carpenter, and uses this knowledge and experience frequently during the design process. Originally from Port Hardy, B.C., Ivory and his family now call Kamloops home. He has served as a board member at his church for more than 6 years, and his focus on family and community often reflects in the overall feel of his designs. Ivory has always been passionate about woodworking and natural stone construction, and loves to incorporate hand-crafted details and other traditional techniques into his builds. When he isn’t spending time with his family, you’ll often find him in his wood shop or working on his sailboat. He even designed and built a carriage house on his property and took special joy in details such as hand-picking the rocks for the exterior from his favourite spots around the Okanagan. Having experienced a custom build himself, Ivory looks forward to connecting with clients to make the design process as smooth as possible. 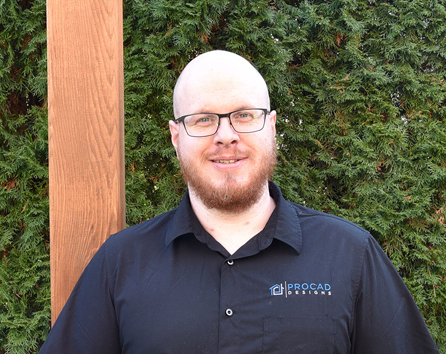 Dan Moore began his journey with ProCad Designs Ltd in 2013. He graduated from the Thompson Rivers University Architectural Program in 2015. He brings with him years of experience as a residential electrician as well as an HVAC and plumbing design technologist for an engineering firm. He’s worked on everything from small residential spaces to large educational institutes, and finds this experience invaluable when designing for ProCad. Dan grew up in the Fraser Valley, and has always enjoyed the great outdoors. He loves to camp and hike, and is also passionate about hunting, fishing, and ATVing. Natural elements often find their way into his designs; whether it’s timber posts in an entryway or a creatively-angled breakfast nook to take advantage of a favourite view, he loves bringing the beauty of nature into his projects. When Dan isn’t outdoors, you’ll find him honing his photography skills, watching a great movie, or cooking a delicious meal. His time spent as a chef means he takes special pride in designing beautiful but impeccably functional kitchen and dining spaces.